The surprise launch of Russia's Sputnik, the world’s first artificial satellite, in 1957 prompted an explosion of interest in the possibilities of satellite technology. Apart from the military implications of its possible development as a weapons platform it also alerted engineers to the potential of using the technology for peaceful applications including the possibility that Arthur C. Clarke's dream of world-wide communications based on Geostationary Satellites might at last be realised. But first some technical issues had to be resolved. 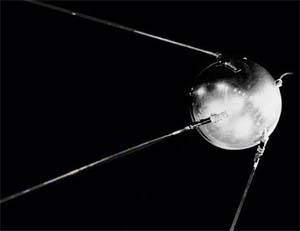 Sputnik 1 was a 23 in (58 cm) diameter polished metal sphere, weighing 184.3 lbs (83.6 kg) at launch, containing a one Watt radio transmitter, powered by two Silver-Zinc batteries, transmitting on 20 and 40 MHz through four external radio antennas. It did not have a receiver. A third battery powered the temperature regulation system. Travelling at 18,000 mph (29,000 kph or 8,100 m/s), it circled the Earth once every 96.2 minutes emitting beeping radio signals from its near omnidirectional antennas at as it went. It served no useful purpose, but was a spectacular demonstration of the Soviet capability in space. A satellite communications link provides "line of sight" transmission of signals between a transmitter and a remote receiver or receivers on the ground via a transponder mounted in a satellite orbiting high above the Earth such that it can be seen by both the transmitter and the receiver. Creating such a link required mastering a series of technologies which were new and radical at the time. Space was an unknown frontier. Satellites had to be placed into a precisely controlled orbits. Once in place there was no possibility of maintenance. Rocket power, guidance and control were still in their infancy when this new communications revolution was launched. Some of the relevant technologies are outlined and explained here. See the Communications Satellites page for descriptions of how Telstar, Syncom, Intelsat, Molniya and ATS satellites rose to this challenge. A Geostationary Earth Orbit (GEO) is an orbit in which the position in sky of the orbiting object remains the same so that it appears motionless to a stationary observer on Earth. To achieve this, the orbit needs to be circular and stationed directly over the equator, with an orbital period equal to the Earth's rotational period of one sidereal day and following the direction as the earth's rotation at an altitude of 22,236.47 miles (35,786.13 kms) above the Earth. The velocity of a satellite orbiting at this altitude is 6,877.82 mph (11,068.78.kph) and this velocity must be precisely maintained for the satellite to appear geostationary. (A sidereal day is the time scale based on the Earth's rate of rotation measured relative to the fixed stars and is equal to 23 hours, 56 minutes and 4.0916 seconds). A Geosynchronous Orbit is also an orbit with the same period as Earth's rotation, in other words it is synchronous with Earth's rotation, but the plane of the orbit can have any inclination between 0 and 90 degrees with respect to the equatorial plane and the orbit may be elliptical rather than circular. To an observer on the ground the orbiting object appears to move North and South in the sky in an elongated 'figure of eight' centred on a fixed longitude, following the same trajectory every day and passing any particular point at exactly the same time every day. A steerable antenna may be required to maintain acceptable communications at the limits of these apparent oscillations. For satellite communications the advantage of the geostationary orbit is that the satellite can be accessed by means of a fixed antenna and it does not need a large steerable antenna on the ground to track the satellite for optimum signal reception. In addition, because of the very high altitude of their orbits, geostationary satellites may have a very wide signal footprint covering up to 42% of the Earth's surface, with the potential to provide "line of sight" communications across oceans and between continents. In practical systems, reliable communications are not possible at the limits of this footprint but a single geostationary satellite can however provide continuous service, which can be accessed by fixed antennas, to subscribers in up to 34% of the Earth's surface. Thus they are ideal for providing low cost television broadcasting services as well as for monitoring the environment and the weather. Disadvantages compared with Low Earth Orbit (LEO) satellites are that orbiting at a higher altitude, they need more powerful launch vehicles to put them in place and the communications system needs higher power transmitters and more sensitive receivers because of the increased path loss. Geostationary satellites also have poor signal coverage in the polar regions. See Look Angles which explains why. For simplicity, the satellite should be launched into a geostationary orbit directly from a launch site on the equator but this is not always possible. In such cases when the satellite is launched from sites in higher latitudes, assuming it is launched at synchronous speed, it will enter a geosynchronous and possibly elliptical orbit because of the inclination of the plane of the orbit. Further orbital manoeuvres will be required to move the satellite into a geostationary orbit. Since there must be a reasonable space between satellites to avoid collisions but more importantly to avoid harmful radio-frequency interference during operations there can only be a limited number of orbital "slots" available for GEO satellites and there are hundreds of commercial and government satellites vying for allocation of these slots and the frequency allocations that go with them. Because of their lower orbits, LEO satellites are able to distinguish details of the Earth's surface much more clearly as they are not so far away so they are ideal Earth observation, remote sensing and surveillance. For the same reason, the two way signal transmission delay is much lower than the transmission delay in GEO systems at only 4 to 8 milliseconds per hop depending on the position of the satellite. LEO satellites however must travel at a much higher angular speeds to remain in orbit since they need a greater centrifugal force to balance the higher gravitational force experienced at the lower altitude. Thus they are non-geosynchronous and will orbit the earth several times per day. Communications will therefore be intermittent since the satellites will only be visible to observers on the ground for short period each time they pass overhead. Tracking such fast moving satellites also requires highly manoeuvrable light weight antennas, and many of them, to provide wide area radio coverage. Another problem with communications satellites in orbits lower than geosynchronous is that a greater number of satellites are required to sustain uninterrupted transmissions. Whereas a single GEO satellite can cover 34 percent of Earth's surface, individual LEO and MEO satellites cover only between 2 and 20 percent. This means that a fleet of satellites, known as a "constellation", is required to provide a global communications network with continuous coverage. Because of their relative simplicity and lower cost, LEO satellites are still used for many communications applications. Satellite telephone systems such as Iridium use LEO satellites because their lower orbits permit the use of relatively low power, low sensitivity telephone handsets. The International Space Station (ISS) and the Hubble telescope are both in LEO orbits, the ISS at 260 miles (420 kms) and Hubble at 347 miles (559 kms). Medium Earth Orbits (MEO) range in altitude from 1,200 miles (2,000 kms) up to the geosynchronous orbit at 22,236 miles (35,786 kms) which includes part of the lower and all of the upper Van Allen radiation belts. Practical orbits therefore avoid these regions. As with all satellites in non-geosynchronous orbits, MEO satellites are only visible intermittently by observers on the ground. The higher the orbit, the greater the footprint. Typical MEO applications are navigation, communications, and geodetic / space environment science. The most common altitude is just above the upper Van Allen belt at around 12,552 miles (20,200 kilometres), which yields an orbital period of 12 hours, and is used for many national navigation systems such as the U.S. the Global Positioning System (GPS). HEO orbits, first proposed by British engineer Bill Hilton, allow the satellite footprint to be concentrated on specific regions of the Earth. The orbit of the Russian Molniya satellites for example which provide telephony and TV services over Russia is designed so that each satellite spends the great majority of its time over the far northern latitudes. With a period of 12 hours the satellite is available for operation over the targeted region for eight hours every second revolution. In this way a constellation of three Molniya satellites, plus one spare, can provide uninterrupted coverage. To provide acceptable signal coverage in high latitudes such as Canada and Russia whose land masses are mostly between latitudes of 50 and 70 degrees North requires very high satellite transmitter powers or alternative satellite orbits which place the satellite directly over the country. The Highly Elliptical Orbit (HEO) specified for Russia's Molniya satellite, now called the Molniya Orbit, was designed to provide this second solution. The Molniya orbit was inclined at 63.4 degrees to the equator and semi-synchronous making a complete revolution of the Earth every 12 hours synchronised with the Earth's rotation. Its perigee in the southern hemisphere was around 310miles (500 kms) and its apogee in the northern hemisphere was around 24,850 miles (40,000 kms). In practice this means that the satellite makes two orbits per day during each of which it moves North and South speeding very quickly through its perigee over the oceans of the southern hemisphere, but slowly hovering around its apogee over the northern hemisphere obeying Kepler's Second Law (Law of Equal Areas) for its highly elliptical orbit. During this time however the Earth is rotating, so the satellite as seen from the Earth appears to be moving eastwards. On the first 12 hour orbit the satellite hovers for about eight hours over Canada and the USA and during the following orbit it hovers for eight hours over Russia. See the Molniya Ground Track diagram opposite. Some would say that this allows the satellite to spy on the USA during the day and to download the information gathered to Russia during the night, but there's nothing to stop Americans doing something similar. Molniya's main purpose however was to provide television and telephony services across Russia and into the Arctic polar region. Its high apogee enables it to provide wide coverage with a single antenna but a disadvantage of the Molniya orbit is that it is not geostationary so steerable antennas were required to send and receive the signals however this is mitigated somewhat by Molniya's slow speed through the apogee which puts less demand on the ground station antenna positioning systems. Twenty four hour continuous national coverage could be provided to a network of ground stations by three satellites each spending eight hours over the country. This was at least better than the option of using a larger constellation of LEO satellites which needed fast acting steerable antennas to follow them. Molniya orbits also had the advantage of requiring less rocket power to launch the satellite into the HEO orbit than to get it into a geostationary orbit. See more about the Molniya Satellite. Satellites in these orbits fly over the Earth from pole to pole in an orbit perpendicular to the equatorial plane. This orbit is most commonly used in surface mapping and observation satellites since it allows the orbiting satellite to take advantage of the earth's rotation below to observe the entire surface of the Earth as it passes below. Many of the pictures of the Earth's surface in applications such as Google Earth come from satellites in polar orbits. When a moving satellite, natural or artificial, enters the gravitational field of a very large object such as a planet or star, its momentum will keep it moving and in the vacuum of space there will be no drag to slow it down so it will keep moving at the same velocity. Its direction will however change due to the influence of the gravitational field causing its path to curve towards the large object. When the centrifugal force acting on the satellite, due to the tangential velocity of its curved path, just matches the gravitational pull of the large object the satellite will enter a stable orbit around the larger object. If the velocity is too low, the satellite will fall into the large object. If it is too high, it will fly off into space. The equations describing the satellite's speed and orbital period are derived from this relationship. All planets move in elliptical orbits, with the Sun at one focus. The line between a planet and the Sun sweeps out equal areas in equal times as the planet travels around its elliptical orbit. In other words: The higher the altitude, the longer the orbital period and the slower the orbital speed. See more about Kepler and the questionable scientific ethics he used to arrive at these laws. It is not always possible to launch a space vehicle directly into its desired orbit. The launch site may be in an inconvenient location with respect to the orbit or the launch window may be very short, a few minutes or even seconds. In such cases the vehicle may be launched into a temporary orbit called a parking orbit which provides more options for realising the ultimate orbit. Using a parking orbit can extend the launch window by several hours by increasing the possible range of locations from which to initiate the next propulsion stage. It also enables the spacecraft to reach a higher perigee by firing the second stage after it has reached a higher point in the parking orbit which will raise its perigee in the new orbit. For manned space missions the parking orbit provides an opportunity to check that all systems are working satisfactorily before proceeding to the next critical stage. The transfer orbit is the orbit used to break out of the parking orbit and break into the geosynchronous or geostationary orbit. The notion of using an elliptical orbit to transfer between two circular orbits in the same plane but with different altitudes was originally conceived by German scientist Walter Hohmann in 1925 and published in his book Die Erreichbarkeit der Himmelskörper (The Accessibility of Celestial Bodies) and the manoeuvre was subsequently named for him. The Hohmann transfer uses two rocket engine impulses, one to move the spacecraft onto the transfer orbit and a second to move off it into a new orbit. The first impulse increases the speed and energy of the spacecraft propelling it into a larger elliptical orbit with its apogee lying on the desired new orbit. The second impulse takes place at the apogee and accelerates the spacecraft once more this time widening the new orbit into a circular path. It does not involve any changes in the plane of the orbit. The inclination of the transfer orbit is the angle between the spacecraft's orbit plane and the Earth's equatorial plane and is determined by the latitude of the launch site and the launch azimuth (direction).To obtain a geostationary orbit the inclination and eccentricity must both be reduced to zero. In the case of launching a satellite such as the Syncom 2 into a geosynchronous orbit, the launch vehicle first stage puts the spacecraft into the parking orbit aligned with its launch azimuth and direction corresponding to the 33 degrees latitude of the launch site. The second stage puts it into the transfer orbit with its apogee corresponding to the geosynchronous altitude after which the satellite separates from the spacecraft. Then the satellite's on board "apogee kick motor" pushes the satellite into the circular geosynchronous orbit still aligned with the plane satellite's launch and parking orbits at 33 degrees inclination to the equator. But a geostationary satellite such as Syncom 3, also launched from a latitude of 33 degrees, needs to change its orbital plane to align it with the equator in order to enter a geostationary orbit. This is accomplished by controlling the rocket's second stage yaw which reduces the angle of inclination of the orbit before separation from the satellite and by controlling the satellite's attitude and hence the direction of its apogee kick motor after separation when it executes its rocket burns in order to tilt its orbital plane driving it into the desired zero degrees inclination from the equator. See Syncom 3 injection example. The satellite is eclipsed by the Earth once per day in the period around the vernal and autumnal equinoxes when the Sun is above the equator. The rest the year the Sun is above or below the Earth's orbital plane and the satellite receives uninterrupted sunlight. During most of the year, the Sun is above or below the orbital plane of the Earth and the satellite so that the satellite receives uninterrupted sunlight. Because the Earth's orbit is tilted at 23.5 degrees, as it moves in its year long trip around the Sun, the Sun appears to move north during the summer months towards its position at the summer solstice when it is above the Tropic of Cancer. As it moves north, its shadow moves south so that it no longer covers the satellite which is in the equatorial plane of the Earth. Similarly when the Sun appears to move south to the Tropic of Capricorn for the winter, its shadow moves north also leaving the satellite in sunshine. The satellite itself being fixed in relation to the Earth, and so tilted with respect to the Sun, experiences the same apparent north and south movement of the Sun about the satellite's equatorial plane, thus changing the angle of incidence of the Sun's rays. The result of all of these movements is that a satellite in geostationary orbit experiences 88 short terrestrial eclipses per year, occurring around the vernal and autumnal equinoxes with a maximum duration of 70 minutes diminishing to zero over a few days as the Sun progresses towards its summer and winter solstices. The Sun is thus visible to the satellite for about 99% of the time. The Incident Solar Energy - The Sun's radiant energy level, or irradiant, impinging every second on a perpendicular plane outside the Earth's atmosphere amounts to about 1367 Watts per square metre and is known as the solar constant. The conversion efficiency of early solar cells in producing usable electrical power from this energy was only about 8%. Maximum power will only be generated from the solar cells pointing directly towards the Sun otherwise the output will be proportional to the cosine of the angle of incidence of the Sun's rays on the cells. For a cylindrical, spin-stabilised satellite with solar cells mounted around its circumference, and its axis parallel to the Earth's axis, power will only be generated from the side of the cylinder facing the Sun and the output will fall off towards the edges of the curved surface as the solar cells present a different, diminishing angle towards the Sun reaching zero when the rays are tangential to the satellite. The power output will also vary with time during the year as the Earth moves around the Sun, peaking during the equinoxes when the Sun is directly over the equator, (except for short daily interruptions due to the terrestrial eclipses), and diminishing towards the solstices when the Sun's angle of incidence is just over 66.5 degrees. Satellites using three-axis stabilisation do not suffer from this problem because their flat solar arrays can be steered to be always normal to the Sun's rays so that all of their solar cells are pointing towards the Sun thus maximising the incident solar energy. Batteries will be required to maintain the power during the eclipses. See more about Solar Power. The satellite has to carry enough fuel for manoeuvring it into its synchronous orbit and for station keeping and attitude control once it is in place. It also needs to be able to capture enough solar energy to power the on board electronics for the transponder and its telemetry and control once it is operational. The associated weight penalty puts a limit on the useful lifetime of the satellite unless the solar panels are large enough to provide the total operational energy requirements of the satellite and its control systems once it has been placed in the desired orbit. Similarly, the allowable weight and finite lifetime of batteries which may be used to store energy also limit the satellite's lifetime. The dimensions and weight are limited by what the launching rocket can accommodate. This in turn places severe restrictions on the performance capability of the satellite. The available on board power is limited, as is the power output of the transmitter. The sizes of the antennas are limited so that signal strengths transmitted and received by the satellite are both very low. See typical example in the Link Budget below. Early satellites were tiny, considering the amount of technology the were able to cram on board. The first major challenge was to design a space vehicle powerful enough and accurate enough to launch a heavy payload into a geostationary orbit as envisaged by Clarke. Military rocket programmes initiated after World War II were beginning to deliver this capability. In the USA the Delta rocket, originally deigned as a ballistic missile, was adapted for this purpose. Like any pure ballistic missile however it did not have the capability to make the necessary changes in its orbit to steer its payload from its launch trajectory into a geostationary orbit. Such manoeuvrability had to be built into the satellite itself by providing it with an independent means of propulsion and directional control. See example Syncom Orbital Injection. All this added to its weight and complexity. Getting a satellite into a desired orbit is only half of the job. Keeping it there is the other half. Objects orbiting the Earth are subject to forces such as solar radiation pressure, (often called solar wind), the varying strength of the Earth's magnetic field and the varying gravitational forces due to the satellite's changing position with respect to the Sun and the Moon and the fact that the Earth is not a perfect sphere. These forces can cause a lateral or precession motion of the orbital plane of the satellite causing it to drift from its desired position and orientation. With the absence of any atmosphere in the vacuum of space, the slightest force applied to the satellite will set it in motion and since there's no resistance to slow it down it just keeps tumbling and drifting further and further away from its prescribed orbit and attitude. Satellites therefore need to be equipped with some method of mechanical station keeping for making corrections to the orbit and for attitude control to keep the antennas pointing towards the Earth and the solar cells pointing towards the Sun, together with some form of energy supply to make the necessary corrections when required. Just as the tiniest of forces can send the satellite off track, it only needs equally tiny forces to bring it back. Gas jet or ion thrusters are often employed for this purpose and it is the capacity and consumption of the propellants they use which ultimately limit the active life of the satellite. Controlling a spacecraft's attitude requires sensors to measure its current orientation or attitude, a control system which calculates the deviation from its desired orientation and determines the forces needed to reduce the deviation to zero and actuators to apply the necessary forces to re-orient the vehicle to the desired attitude. The actuators are normally part of the stabilisation system and may be gas thrusters or momentum wheels. When two electromagnetic waves with the same frequency combine, the resulting pattern is determined by the phase difference between the two waves. Waves that are in phase will undergo constructive interference or reinforcement while waves that are out of phase will undergo destructive interference or cancelling. This property can be used to determine the phase difference or the delay between two waves coming from the same source. The diagram opposite shows a single radio wave from a distant ground station impinging on two antennas attached to a satellite on a plane which is inclined with respect to the direction of the wave. The signal arriving at the left anntena will be delayed with the delay T depending on the angle Θ between the plane of the antennas and the plane of the wavefront. The comparator gives an output depending on the phase difference between the signals from the two antennas. The magnitude of the delay or phase difference between the signals can be determined by inserting a known (variable) delay into the non-delayed signal to drive the error signal to zero, thus bringing the two signals from the two antennas into phase. Since the distance between the antennas is known, the tilt angle between the satellite body and the direction of the radio wave can be determined. The signal delay depends on the frequency or wavelength of the radio wave. For a 6.0 GHz (C-Band) telemetry signal, the wavelength will be around 50 millimetres enabling accurate determination of the angle of inclination or attitude of the satellite. The greater the distance between the antenna pairs, the greater the accuracy. The error signal may be transmitted to ground control to manage the satellite's attitude or in could be used in an on board control system which is programmed to keep the signals from the two antennas in phase. Radio frequency interferometry can unfortunately only be used with pairs of antennas whose distance from the source may be different. Thus it can only be used to monitor two of the three orthogonal axes of a geostationary satellite, namely pitch and roll, but not its yaw. This is because the interferometry antennas must be attached to the surface of the satellite and directed towards the Earth from whence the radio signal is transmitted. When the satellite rolls, the surface on which the antennas are mounted appears from the Earth to tilt forward and back in elevation. When the satellite pitches, the surface appears to tilt right and left in azimuth as the satellite increases or decreases its altitude. But the satellite's yaw axis is pointed towards the centre of the Earth and when the satellite executes a yaw, changing the inclination of its orbit or its latitude, the surface of the satellite facing the Earth appears to rotate about its centre staying normal to the direction of the radio signal so that there is no differential delay between the signals received by pairs of antennas on the surface. Other methods such a star tracking (see next) must be used to determine the yaw. The star tracker uses a camera, with a star map projected on to its focal plane to track the image of a reference navigation star such as Polaris, the Pole Star. The navigation target star should be at the centre of the star map, and on the optical axis of the camera. The camera is mounted on the satellite in such a way that, when the satellite's attitude is correctly oriented, the optical axis of the camera will be aligned with the target navigation star and the optical image of this star will be centred directly over the reference image of the navigation star on the star map. A photo-multipier is used to increase the intensity of the very weak light received from the stars. If the orientation of the satellite changes, the image of the target star will deviate from its central position on the star map. (See diagram opposite). This angular error between the camera's optical axis and a line to the target star is detected by electronically scanning the camera's field of view and generating X and Y error signals proportional to the angular error. The error signals thus generated are used to correct the orientation of the spacecraft so that the target star is centred once more on the star tracker's optical axis. In general, star trackers are the most accurate of attitude sensors, achieving accuracies to the arc-second range. However star sensors are heavy, expensive, and require more power than most other attitude sensors. In addition, they require on board computing power to scan the images and carry out pattern recognition to identify the target star followed by calculations of the angular error and implementation of the control actions needed to re-orient the satellite. To avoid interference from the Sun, star tracker cameras are usually fitted with Sun shades and, where possible, target stars are chosen so that the camera will be mounted on the side of the satellite in the Sun's shadow. A simple though less accurate method of determining a spacecraft's attitude is by sensing the direction of the Earth's horizon. Infrared bolometer (radiometer) detectors, which measure the power of incident electromagnetic radiation by measuring its heating effect on a temperature dependent electrical resistance, can determine the position of the horizon by detecting the difference in the intensity of radiation coming from the Earth just below the horizon and the radiation coming from space just above the horizon. Spin-Stabilisation is a simple and effective method of keeping a satellite's attitude, that is the orientation in space of its spin axis, pointed in a certain direction. A spacecraft spinning on its axis resists perturbing forces in the same way that a spinning gyroscope or a top does so that its attitude (but not its position) remains fixed in space. According to Hughes' engineers, spin-stabilisation is "the method that nature prefers". Another advantage of spin-stabilisation is that in space, once the satellite is spinning there are no frictional forces to slow it down so that it will keep spinning indefinitely. There are however some inherent inefficiencies associated with this method of stabilisation since only some of the solar cells can be illuminated by the Sun at any one instant as the satellite rotates. At the same time the satellite needs omnidirectional antennas so that at least some of the antenna's beam is always pointing towards the Earth as the satellite rotates. This leaves most of the radio wave energy wastefully radiated into space. Overcoming this problem requires complicated systems to de-spin the antennas allowing the use of higher gain structures which can be kept in a fixed direction pointing towards the Earth. Satellites and gyroscopes also suffer from nutation or coning, that is the tendency of the spinning body to nod or wobble around its spin axis. Spin stabilised satellites usually incorporate some form of hydraulic or mechanical damping to reduce this effect. Three axis stabilisation, also called body stabilisation, does not require the gyroscopic rotation of the satellite body for stability. Instead it keeps the satellite body in a fixed attitude, allowing the solar energy capture and radio transmission and reception to be optimised independently. Momentum wheels, similar to gyroscopes, which spin in one direction only. Reaction wheels which can spin in both directions. These wheels are mounted in three orthogonal directions corresponding to the yaw, roll and pitch of the satellite body and provide a stabilised inertial platform. Accelerating or decelerating any of the wheels by means of electric motors or gas jet thrusters increases its angular momentum in that direction by an amount which is proportional to the applied motor or jet torque and this in turn creates an equal and opposite torque on the satellite body causing it to rotate in the opposite direction about the axis of the wheel. Slowing the wheel brings the satellite body back again. Thus angular momentum can be traded back and forth between the spacecraft and the wheels. Thrusters are still required for lateral movement. Reaction Control Thrusters are an alternative method providing three axis stabilisation. Attitude correction can be implemented by three small gas thrusters, mounted on three orthogonal axes of the satellite, which nudge the satellite back into position. It may be simpler but less precise than the reaction wheel stabilisation methods and possibly unsuitable for some optical applications or experiments may be affected by the ejected gas particles. With this method of stabilisation the shape of the satellite body and appendages is no longer important. Sub-systems can be accommodated in any conveniently shaped box. Several antennas and solar cell arrays can be deployed and pointed in the different directions, optimised for the application. In 1967 the U.S. DOD carried out a successful experiment to test the feasibility of Gravity-Gradient Stabilisation, also known as Tidal Stabilisation for spacecraft or satellite station keeping. Like three axis stabilisation it does not require the gyroscopic rotation of the satellite body for stability. It is however a passive system which uses the Earth's gravitational pull to keep the satellite in a stable attitude. Active stabilisation by means of gyroscopic action, thrusters or reaction and momentum wheels requires the use of propellants or electricaal energy to keep the satellite on station and the finite capacity of the satellite to carry these propellants sets a limit to its active life. Gravity gradient stabilisation however does not need propellants. It relies instead on the satellite's mass distribution within the Earth's gravitational field and the balance between the gravitational and centrifugal forces acting on it to keep the satellite aligned in the desired orientation. See the following diagram. A body with an unbalanced mass in free space will tend to line up under the influence of gravity with its heaviest part closer to the ground so that its axis of minimum moment of inertia, or its longest dimension, is aligned vertically, that is radially from the centre of the Earth.. But because the gravitational pull of the Earth decreases according the inverse-square law, at very high altitudes and the small size of the orbiting body, the difference in the gravitational force across the body are minute making such a system ineffective. If however the effective size of the body is increased by separating off a small part of it and connecting it by a long tether to the larger mass of the main part, the effective size of the body is increased and the differential gravitational force across it will likewise be increased creating an appreciable gravity gradient across the body sufficient to keep it aligned in a fixed direction. The tether is kept tight because both parts of the body are orbiting at the same angular speed, but the smaller part is orbiting at a higher radius therefore experiences a greater centrifugal force. In practice the smaller part can be designed to accommodate part of the spacecrafts functionality. The example above shows this as telemetry but it could be any other convenient function. Using a variety of retractable booms the DOD experiment explored the possibility of stabilising a satellite along different axes. The mission was a success and proved the feasibility of achieving tri axial gravity-gradient stabilization at synchronous altitudes using passive and semi passive techniques. Despite its feasibility and its fuel saving benefits, gravity gradient stabilisation has only occasionally been adopted in practical systems. This is the payload which communications satellites are designed to carry. Transponders are microwave repeaters located at intermediate points in a communications link which are used to compensate for the signal attenuation along the route so as to extend the range of the link. They receive the very weak signals from a sender at one end of the link, amplify them, and re-transmit them at much higher power to the receiver at the other end of the link. The whole purpose of a communications satellite system is to place a transponder in position, to keep it there and to keep it powered up. Because of the very high launch costs, for satellite systems to be economically justified, the transponder should be able to carry high traffic volumes including television channels as well as dozens of multiplexed voice communications and other data links. It should also be small and light. When the first projects were conceived there were no solid state devices available which could provide the high power broadband amplification at the high frequency needed for the repeater and early transponders used pencil slim vacuum tubes (Travelling Wave Tubes (TWT)) to provide the necessary amplification. Besides amplification repeaters also perform a frequency shift. Because of the proximity of a satellite's high power transmitter to its very sensitive receiver, and in many cases the use of the same antenna for receiving and transmitting the signals, the high power signals from the transmitter can swamp the very weak received signals causing problems in the receiver. To minimize this problem the transponder contains a converter which changes the frequency of the received uplink signals to a different frequency, widely separated from the uplink frequency, for onward transmission by the downlink. It also incorporates a diplexer which connects both the transmitter and the receiver to the same antenna input/output port by means of filters which block the transmitter signals and other forms of interference from leaking into the receiver. Other than frequency conversion (heterodyning) and amplification there was no other on board signal processing on the early satellites. Simple transponders of this type were called bent pipe transponders. Modern transponders can carry many different types of communications traffic. They can also receive signals from multiple ground stations, combining (multiplexing) or splitting (de-multiplexing) them for onwards transmission to other multiple ground stations. This method, by which many users share a common satellite resource, is called Multiple Access. There are several schemes for accomplishing this, each with its benefits and drawbacks. TDMA - Time Division Multiple Access allocates a time slot to the user in a repetitive time frame. The signal is digitised and the data bits are stored in a buffer in a compressed time frame until their allocated time slot comes around when they are transmitted during their allocated time. At the receiver end of the link the bits are rearranged, spreading them out to reassemble the original digital signal and converted back to analogue form. The signal occupies the entire transponder bandwidth, but only during its allocated time slot. The rest of the time the bandwidth is available to other users. Digital signals typically have better noise immunity than analogue signals. FDMA - Frequency Division Multiple Access shares the bandwidth between the users, with each user allocated a unique, narrower section of the available bandwidth. It works with analogue signals and all users have uninterrupted use of their own narrow frequency band or channel with all users occupying the available bandwidth simultaneously, each within their own narrow channel. The sender's signal, called the baseband signal, is frequency shifted into the allocated frequency band for transmission and the receiver restores it back to the baseband. CDMA - Code Division Multiple Access, also known a Spread Spectrum, modulates the user's signal with a pseudorandom code so that it occupies the full available spectrum, appearing as noise. The receiver uses the same pseudorandom code in an autocorrelator device which only recognises a signal modulated with the same auto code and thus separates it from the noise. CDMA is more complex but has better noise immunity and provides greater security than the other two systems. Telemetry systems monitor the status of the satellite's systems including the functioning of electronic and propulsion sub-systems and its energy management as well as its attitude and position in space and provide the capability to transmit this information to a control centre on the ground. Command systems use the telemetry inputs in control systems to compare the satellite's actual status with its desired status and to transmit control signals back to the satellite to operate on board actuators such as switches, solenoids, motors or propulsion jets to keep the satellite operating within its design parameters. The control functions include manoeuvring, antenna deployment, station keeping, attitude control, energy management and communications channel switching. Spacecraft usually incorporate a Beacon which sends out a signal which enables it to be tracked by a ground station. They normally use separate, dedicated radio channels and antennas for these functions. Latency usually refers to the time it takes a bit or packet of information to dribble through a local network or signal processing equipment from its input point to its output point. It is often of the order of microseconds or somewhat longer for long distance cable connections. For a satellite network however, the signal paths, or hops, include both the long uplinks and downlinks between the ground and the satellite. Control signals pass up the uplink and telemetry signals return to the signal originator down the downlink. Communications signals pass through the satellite and onwards to the remote receiver. Despite the fact that electromagnetic wave carrying the signal travels at the speed of light, the distance across the network is so large that the delays are of the order of milliseconds and thus much longer than the delays normally associated with the signal processing equipment. Both communications and satellite control systems include uplink and downlink signals so that the signal path distance D per hop is a minimum of 44,600 miles (72,000 kms) depending on the user's position relative to the satellite. the corresponding propagation delay is around 240 seconds, but could be as high as 250 - 280 milliseconds for users who are not directly underneath the satellite. For one-way signals such intercontinental television broadcasts, this delay is not particularly annoying or even apparent, but for the satellite's telemetry and control systems the delay could cause unacceptable errors and special error detection and correction circuits may be needed for safety reasons. The delay is more significant for two-way telephone conversations since the effective delay for the round trip between when one person speaks and the other responds is essentially double the basic hop delay at around 540 milliseconds which is definitely noticeable. This delay may not be dangerous but it can be quite annoying and echo cancellers may be needed for high quality speech transmission. For LEO satellites the propagation delays between sending and receiving information bits or packets are relatively low due to the shorter signal paths and amount to between 4 and 10 milliseconds for a single hop depending on the position of the satellite relative to the user. This is comparable to the delays experienced in long-distance cable connections (about 5–10 milliseconds). For an MEO satellite orbiting at 5,000 miles (8,000) kms the delay will be around 125 milliseconds per hop. In practice however delays could be much longer than this if the call needs to be transmitted across multiple hops which is not unusual with LEO and MEO systems which use multiple satellites in order to provide continuous coverage. The decibel (dB) is a logarithmic unit used to express the ratio between two values of a physical quantity. Power ratios of 2, 10 and 100 correspond to 3 dB, 10 dB and 20 dB respectively. It is typically used to express the gain or attenuation of a system or circuit. The dBm is a measure of the signal level relative to 1 milliWatt expressed in decibels. The dBW is a measure of the signal level relative to 1Watt expressed in decibels. Antennas are normally passive devices. Though they have gain, they do not add any energy to the signal. Instead they concentrate the available transmitted or received signal energy into a preferred direction. See the diagrams below which show the radiation patterns of a different antennas. The Equivalent Isotropic Radiated Power (EIRP) of an antenna is equal to the product of the Input Power applied to the terminals of the antenna and the Antenna Gain. Example: A typical ground station communications transmitter with an output power of 100 watts, (20 dBW) feeding through an antenna with a gain of 60 dB will have an equivalent radiated power (EIRP) in the direction of the antenna main beam of 80 dBW or 100,000,000 Watts. An Isotropic radiator is an omnidirectional antenna which radiates equally in all spherical directions. The simplest and most common radiating element is a half wave dipole whose radiation pattern is a toroidal shape. It is formed from two conducting elements such as wires or metal tubes whose length is one half wavelength of the radiating radio wave. It is typically fed in the centre where the impedance falls to its lowest such that the antenna consists of the feeder connected to two quarter wavelength wires or elements in line with each other. Dipoles can also formed by radiating slots in the walls of a waveguide carrying the radio frequency signal. More complex, higher gain antennas may be constructed from multiple radiating elements so that their individual radiation patterns reinforce or cancel each other to form the desired composite radiation pattern. Alternatively the radiation pattern may be formed by means of a reflector such as a metal parabolic dish which concentrates the antenna beam from a single radiating element, located at the focus of the parabola, in the desired direction. Antenna Directivity is the ratio between the power density the antenna radiates in the direction of its strongest emission and the power density radiated by an ideal isotropic radiator, radiating the same total power from the same point. 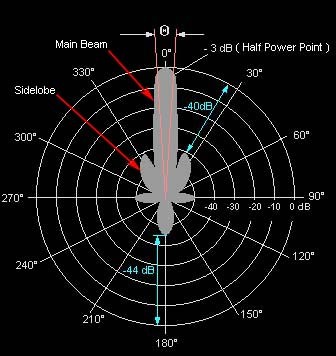 Antenna Beamwidth, by convention, is the angle between the half-power (-3 dB) points of the antenna's main beam (or lobe). The higher the gain, the narrower the beamwidth. Thus a 2.1 GHz (S Band) signal transmitted by a 10 metre parabolic antenna will have a beamwidth of 1.0 degree. Antenna Efficiency is the ratio between the total power actually radiated by an antenna and the net power accepted by the antenna from its connected transmitter. It takes into account any impedance mismatch, the conduction and dielectric losses in the antenna structure and feed circuits and the energy lost in the sidelobes. Antenna Gain in transmitting mode is the ratio between the actual power delivered to a far field receiver on the axis of the antenna's main beam and the power which would be delivered to the same receiver by a hypothetical lossless isotropic antenna located at the same point as the transmitting antenna. Note that the "gain" takes into account the antenna efficiency whereas the "directivity" does not. Gain and directivity are often incorrectly used interchangeably. Reciprocity: For high gain antennas designed to carry two-way communications, the antenna gain in transmitting mode is usually the same as the gain in receiving mode for any given frequency. This is known as reciprocity. However in normal operations the transmitter frequency will be offset from (usually higher than) the receiver frequency to avoid interference between the transmitter and the receiver. Because of this frequency difference the actual gain will be slightly higher in the higher frequency transmission mode. Figure of Merit of a receiving system is the ratio (G/T) of its gain to its noise temperature where G is the antenna gain in decibels at the receiver frequency, and T is the equivalent noise temperature in degrees Kelvin of the antenna plus its RF signal path to the receiver and the noise temperature of receiver itself. Antenna Footprint is the geographical area covered by the beam of a satellite antenna, within which acceptable communications with the satellite are possible. From a geosynchronous orbit, a satellite antenna with a beamwidth of 17.3 degrees covers the 42% of the surface of the Earth facing the satellite from which line of site communications are theoretically possible. See Orbits diagram. The practical extent of a satellite's footprint is however determined by the capability of the system to deliver reliable communications at its outer limits. The link budget gives an indication of the expected signal levels on which these limits are based. The theoretical footprint of a parabolic satellite antenna on a surface normal to the direction of its transmission beam is typically circular in shape. The higher the gain of the antenna , the narrower its beam. The diameter or extent of the practical footprint or signal coverage on the ground depends on the satellite transmitter power, the receiver sensitivity and the gains of both the satellite transmitting antenna and of the receiver antenna. Optimising the footprint involves several trade-offs. With a simple, low gain antenna, much of the satellite's available transmitted energy is radiated into space with only a low percentage of it falling on the Earth. Higher gain antennas directed towards the Earth can concentrate more of the transmitted energy towards the Earth with very high gain antennas focusing the energy into a desired small region or footprint. For a given transmitter power, if the received signal level within the desired region is not sufficient for acceptable or reliable reception over the entire region, there's no point in increasing the transmitter antenna gain any further as this will just reduce the footprint even more. Increasing the footprint requires increasing the transmitter power. Alternatively, for a given receiver sensitivity, the use of higher gain (larger) receiver antennas on the ground can compensate for the lack of transmitter power. The satellite's effective footprint is improved because a larger receiving antenna can capture and raise the power of lower level signals to the level which the receiver can process. The higher the gain of the receiving antenna, the larger footprint from which acceptable signals can be received. 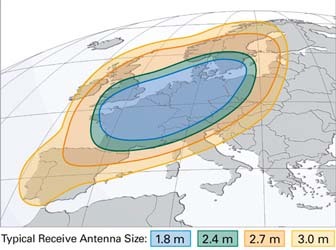 The diagram above shows the different footprints associated with different domestic receiver antenna sizes (or gains) of the Astra 1A satellite system designed for direct broadcast of television channels in Europe. Note that the satellite's antenna pattern is not necessarily circular. The cross-sectional pattern of the antenna beam can be shaped by altering the profile of its reflector dish or the structure of its transmitting elements to change the shape of the footprint on the ground in order to concentrate the satellite transmitter's energy on particular geographical areas. Alternatively several smaller antennas may be used to achieve the same effect. While increasing the gain of the transmitter antenna may be beneficial in enabling the satellite signal to be focused on very small target areas, for wider coverage, several transmitting antennas may be needed, but this in turn requires more transmitter power. The look angles are the azimuth and elevation angles of a satellite as seen from a ground station antenna. The maximum signal level will be received by a ground station when it is directly under the satellite, that is, at the same latitude and longitude as the satellite or at the satellite's "ground zero" so that the ground station's antenna is pointing in a direction perpendicular to the plane of the Earth at the at point. As the angles of azimuth and elevation (the look angles) between the satellite and the ground station decrease from 90 degrees, the distance between transmitter and the receiver increases so that the free space path loss also increases. At the same time the distance between the satellite and the ground station also increases as the surface of the Earth curves away from the ground zero point causing a further increase in the path loss. The decrease in the look angles also causes the signal path through the lower atmosphere to increase resulting in greater attenuation of the signal. At great distances from the satellite's ground zero position the look angles will be very shallow and signals will be subject to interference or blocking from obstructions such as mountains, buildings and trees. For these reasons the signal coverage by geostationary satellites becomes progressively worse at higher and lower latitudes becoming unusable in the polar regions. A key limiting factor in determining the performance of a communications link is the amount of noise in the receiving system, sometimes called the noise floor which sets the fundamental lower limit to the signal level necessary for extracting the transmitted message from the noise. In general terms, the greater the noise, the greater the signal level has to be to avoid being lost in the noise, however modern signal processing techniques enable signals to be extracted from well below the noise level. The noise comes from two main sources, antenna noise which is the unwanted background microwave radiation, solar and cosmic rays picked up by the antenna and the thermal, interference and other impulse noise generated in the receiver electronic circuits. Noise and Bandwidth: The amount of noise in a communications channel also depends on the bandwidth of the channel. Random noise tends to be spread across a very wide spectrum and the broader the channel bandwidth, the more of this noise it will contain. The Noise Temperature, measured in degrees Kelvin, is a convenient measure for quantifying the effect of the noise and it allows the total effect of all the contributors to the noise to be calculated simply by adding together the individual temperatures of each contributor. It is the thermal equivalent of the noise source or sources and not necessarily an actual temperature. The thermal noise generated within the receiving equipment is the biggest factor and receiver is often cooled to a very low temperature, close to absolute zero, to minimise this noise. The Signal to Noise Ratio, (specified in dB), at any point in a communications link is the ratio between the signal level at that point and the level of the level of the background noise. Note that when the signal level is below the noise level the ratio will be negative. Noise Figure and Sensitivity: The Sensitivity of a radio receiver is the minimum detectable input signal level necessary to obtain a given output signal to noise ratio. In satellite systems, the measure of receiver's capability to handle low level signals is not usually specified as a signal level, but rather as a noise figure (specified in dB) which is the amount of noise added to the signal by the receiving antenna and the receiver electronics. The receiver sensitivity, can also be specified as a Figure of Merit which is the ratio of its gain to noise temperature or G/T where G is the gain and T is the noise temperature. Other Noise Sources include interference from other external electrical signals or discharges, crosstalk which is interference from adjacent parts of the communications system and intermodulation noise due to non-linearities in the system's signal processing which cause two or more frequencies in the signal to create other frequencies which did not exist in the original signal. The link budget is an aid to specifying the required performance of the major components which make up the communications link. Prx, the minimum signal level that the receiver can distinguish above background noise. The Free Space Path Loss L between the transmitter and the receiver. It is not due to attenuation of the signal, but to the dispersion or spreading of the signal as it radiates outwards and is represented by the inverse square law which indicates the reduction in radiated signal strength as the distance increases. The path loss is also proportional to the square of the frequency. Note that the free space path loss is related to number of wavelengths traversed. The free space path loss for a geostationary satellite, is on the order of 200 dB (or a factor of 1020). There are also Attenuation losses A due to atmospheric conditions such as rain which absorb energy from the radiated signal as well as other miscellaneous efficiency or resistive losses in the system transmission channel. The transmitter power Ptx and the transmitter and receiver antenna gains Gtx and Grx must be dimensioned to compensate for the path loss and other losses in the system to ensure that there is adequate signal strength at the receiver to recover the message from the background noise. Note that the antenna gain and the path loss are both proportional to the square of the frequency, (but with different proportionality factors) so that increasing the transmitter frequency improves the antenna gain, but also increases the path loss. The signal levels shown in the following path loss diagram are typical of a satellite link. The signal power radiated by the Earth station is about 30 dB (1000 times) greater than the signal power radiated by the satellite and the Earth station is able to receive weaker signals (and extract them from the noise) with levels of more than 20 dB (100 times) lower than the satellite can handle. Note that the ground station transmitting antenna gain is different from the receiving antenna gain even though this is the same antenna. This is because the uplink frequency is higher than the downlink frequency. By contrast the satellite transmitter and receiver antennas have the same gain. This is because they use different antennas. Because of size, weight and power supply restrictions, satellites are typically only equipped with meager resources but fortunately, the link budget above shows that this can be counterbalanced by having very well endowed ground stations. Thus very high power transmitters and very sensitive receivers feeding through very large antennas on the ground compensate for low sensitivity receivers and low power transmitters feeding through small antennas on the satellites. The noise figure of a modern satellite ground station receiver is typically less than 1 dB, whereas the noise figure for a satellite on board receiver may be around 10 dB. At the same time the satellite transmitter power may be less than 10 Watts, while the power output of its related ground station could be tens of kiloWatts. Unless the satellite is in a perfect geostationary orbit, the ground station antenna must be steerable to track it across the sky. It's tempting to think of space as a benign vacuum, but in reality it can be a hostile environment. The orange coloured regions are toroidal shaped Radiation Belts circling the Earth. 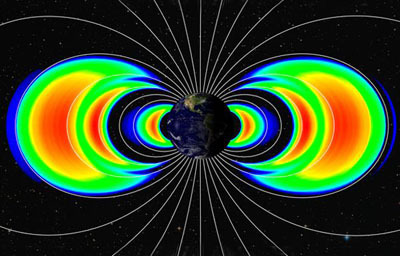 The Van Allen Radiation Belt is a region of high energy charged particles moving at speeds close to the speed of light encircling the Earth which can damage solar cells, integrated circuits, and sensors and shorten the life of a satellite or spacecraft.. It is toroidal in shape and centred along the earth's magnetic equator with intensity diminishing towards the poles and extending from the upper atmosphere through the magnetosphere, or exosphere. Held in place by the Earth's magnetic field, the particle field varies in size with solar conditions from time to time but generally extends from an altitude of about 600 miles to 37,000 miles (1,000 kms to 60,000 kms). Considered as a single belt of varying intensity, the particles are concentrated roughly into two layers which overlap the LEO and MEO orbits. The inner layer which extends between altitudes of about 1000 and 3000 miles (1600 and 4800 kms) contains mainly protons with some electrons and is thought to have been created by the collisions of cosmic rays with atoms in the upper atmosphere. The outer layer is composed mainly of electrons, which are responsible for the Aurora Borealis in the polar regions, and are believed to have originated from the atmosphere and from solar wind, the continuous flow of particles emitted by the Sun in all directions. Both radiation belts additionally contain smaller amounts of other nuclei, such as alpha particles. The upper layer is much larger than the inner layer extending between 8000 and 12,500 miles (13,000 and 20,000 kms) and its size fluctuates widely as its particle population increases and decreases as a consequence of geomagnetic storms triggered by magnetic field and plasma disturbances produced by the Sun. It has also been claimed that the particles are the result of testing nuclear weapons. Recently a third radiation belt was discovered using more sensitive instruments. A temporary phenomenon, it was a thinner later separated from the inner edge of the outer layer which later merged back into the outer layer. The creation and re-absorbing of this third layer was said to be caused by a mass coronal ejection from the Sun, (A massive burst of solar wind). The Van Allen belts can pose a severe danger to satellites and spacecraft, with hazards ranging from minor communications anomalies to the complete failure of critical systems. To minimise potential problems due to radiation, satellite orbits are designed as far as possible to avoid the Van Allen radiation belts and sensitive electronic components must be protected by shielding if their orbit spends significant time in the radiation belts. Solar cells however are particularly vulnerable to radiation damage since they depend for their operation on capturing the Sun's radiation and are therefore difficult to shield from other radiation sources. It goes without saying that the Van Allen Radiation Belt is also dangerous to human life. Satellites operate in extreme thermal conditions with their surface temperatures ranging from -150 �C to 150 �C depending on whether the surface is in direct sunlight or in the shade and its electronic components are vulnerable to permanent damage at both of these extremes. The threat is compounded because of the possibility of further structural and fatigue problems due to the high temperature gradient across the satellite body as well as the deep repetitive temperature cycling as the satellite changes its attitude with respect to the Sun. These latter two effects however can also be harnessed to provide the means for mitigating the extreme effects by re-distributing the heat and evening out the temperature. The possibility of a collision with space debris is becoming a real problem for satellites. Besides the presence of micrometeorites, the space around the Earth is becoming cluttered with spent rocket stages, old inactive satellites, lost tools and components, fragments from disintegration of other space structures, erosion, and collisions. The issue is especially problematic in geostationary orbits (GEO), where the number of available orbital slots is limited with many satellites sharing the same orbital path, often clustered over the primary ground target footprints. As of 2009, the U.S. Strategic Command was tracking about 19,000 pieces of debris larger than 2 inches (5 cm), with a further estimated total of over 600,000 pieces smaller than 0.4 inches (1 cm) of which 300,000 pieces were circulating below an altitude of 125 miles (200 km). These pieces may be small but space junk is usually travelling at relative speeds of 30,000 m.p.h. or 50,000 k.p.h.or more with enormous kinetic energy capable of doing catastrophic damage.